For many of us, although days at this time of the year may be shorter, the season seems to be longer than the other seasons of the year. Is it because we isolate ourselves more because going out seems to present more challenges, hiding from the cold and wetness of the outdoors, or is it partly the dullness of the day and less colour than the other seasons of the year? Spring brings with it the beautiful fresh buds of spring blossoms and for those of us who live near more rural areas the new life as the young lambs begin to populate our fields. With summer there is the bright blue clear sky and fluffy white clouds and in autumn we have the beauty of autumn leaves bringing a different range of colours. Winter can be a time for more reflection about ourselves, the meaning of our lives and our relationship with God and with others. It is a time when people can become more depressed especially with the extreme bouts of coughing, sneezing, and influenza that greet us at this time of the year. A few weeks ago we heard in Mark’s Gospel about the alleged rift between Jesus and his family, and his own brothers and sisters not believing in him. They even went as far as considering him to be “out of his mind”. Even the authorities of the time were growing in their opposition to him. When we tend to spend more of our time hibernating, it is so easy for us to feel unsupported, unappreciated, or even unwanted and unloved. We must not fail to remember that we are all created in God’s image and as such are all loved, accepted and considered to be part of God’s family. During the school holidays when a few of our young children were away a small group made a church from Lego blocks. They did a great job of the building right down to people and the cars that brought them to church. We talked about the many different coloured blocks that made up the building. We remembered that the church is actually not the building but the people who gather together. These people are all different and bring gifts and talents to share in making a better place for others. They created a great metaphor while having fun. Thank you Emma and Judy for encouraging them and to see the important part that they, along with all the other people have, in God’s family. We have been reminded by our scriptures that Jesus needed to take time to be apart from the crowd. He needed time for rest and re-creation. This often followed heavy periods of preaching, teaching and healing but it also preceded the times when he had to make decisions or was about to face challenging times. If Jesus needed to take such times out, how much more important is it for each of us to do likewise? I am grateful to Jo Mawdsley for organizing our next Quiet Day which I am really looking forward to especially as it immediately precedes my taking two weeks of leave for my own rest, relaxation and recreation. May you too find time to spend some quiet time with God as we all need to be refreshed, restored and re-created in the image of God. when I realise that I am a child of God. “Your sense of identity comes from me. Please let Noeline know if you would be willing to put your name of the roster for cleaning the church. The Handel Consort & Quire presents Blest Pair of Sirens at St Andrew’s Anglican Church, Pukekohe. Music by Palestrina, Gabrieli, Weelkes, Parry and others. Directed by Robert Howell with Michael Bell on the organ. Door sales $35 adults and $30 seniors. You can save $10 off these prices by booking through the Parish Office. Phone Noeline 09-238 7228. As Bob and Jan will be away at this time, can you please let Jan know if you would be able to assist with this event. The Ven. Sarah Moss, Archdeacon — Ministry Review and Planning, will be meeting with the Vestry to discuss the Parish review before the first Parish meeting on Sunday September 16. A further Parish meeting will be held on November 4. Please try to keep these Sundays free to attend the meetings. We have met with representatives of the Buckland Hall Committee. Next we meet with Jenny Walter (architect), Matthew Brunton (Diocesan property manager), Bryan Pooley (senior built heritage specialist, Auckland Council), and Anna McLellan (of The Surveying Company). The General Trust Board had been asked for their approval and we will present a petition to the Bishop of Facility. 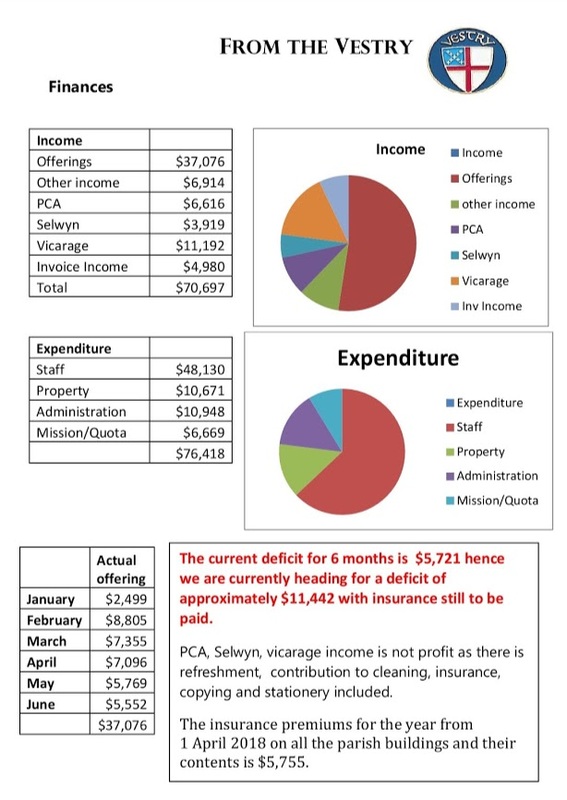 Talitha Gibbons’ draft report has just been received on the impact of the tree roots on the structure of the church. Talitha has come up with some different information showing the roots are affecting the church. Talitha’s final report, along with Matthew Paul the Arborist’s report, will be submitted to the Auckland Council for resource consent. The reports appear very helpful in gaining support for the consent. The liquidambar tree on the vicarage lawn has lost significant branches during the winds we have had this year and is potentially dangerous. Consent is being sought to remove this tree as well. As the oak tree did not have sufficient wood removed from it with the earlier pruning, this will be further reduced. The branch protruding over Queen St will also be pruned back. A report is awaited from Matt Paul then the resource consent application will be submitted to the council. Work on the ultra-fast broadband connection for the parish complex is expected to start any time now. Jan is to be contacted if anyone sees the Chorus van on site. This is important as the drop point for supply to the office is to be in a place which is different from the original plan. Each year the residents of the retirement village come together for their annual meeting. This is always a good time to get together and hear their comments. Minutes and reports are sent to the government bodies that oversee retirement villages. Thank you to all the volunteers who work in the Parish Op Shop for your very generous support of $7500 for the work of Pukekohe Community Action. This enables a significant amount of the parish work in the community. It also pays for the perishable items that are included in our food parcels. A very special thank you to Judith and Alistair Parke and to Elaine. Also thank you to the Pukekohe Rotary for their generous donation of $6000. Thank you Graham, Eve and Paul Brown for your work with this. And, last but not least, thank you for the support of the parishioners with the pyjama drive. We have been able to deliver around 530 pairs of new winter pyjamas to children whose school identified them as being vulnerable in the cold damp season. The aim is to reduce the disproportionate number of children from the Franklin area who are admitted to Middlemore Hospital with chest infections. A special thank you to John and Judy Bennett and Bob for your valuable time in sorting, counting and delivering the pyjamas. Submissions on the Government’s Zero Carbon Bill closed this week.  The submission by Anglican’s Climate Action Network was that we supported the need to create certainty around New Zealand’s response to the challenges of our changing climate. One is that the overarching principle of social justice must apply in developing the Zero Carbon Bill. Not just for New Zealanders, but for all peoples of the world and for future generations. This implies equality in terms of the distribution of wealth, opportunities, privileges and obligations. The second caveat was that the principle driver of climate change — our mining and burning of fossil fuels that add new carbon to the atmosphere — must go to zero. So the 2050 reduction target must focus mainly on the release of new carbon to the atmosphere, and less on the recycling of existing carbon gases. New carbon is defined as carbon that is locked into the earth as coal, oil and natural gas, and is therefore, not already within the existing carbon cycle. The third caveat was that a goal for “net zero emissions” is not adequate because it assumes an unspecified level of gross carbon emissions with offsetting to achieve a targeted net position. Offsetting by planting trees and purchasing international carbon credits is not sustainable because the supply of land suitable for tree planting is limited, and the Government cannot guarantee that it will be able to purchase international carbon credits indefinitely. What do you think? Is this a fair and reasonable position?